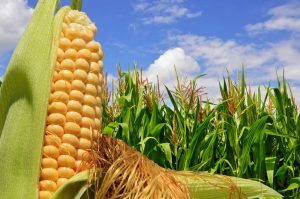 The Southern Region October Crop Production has Corn production in the United States is forecast at 14.3 billion bushels, down 6 percent from last year. Based on conditions as of October 1, yields are expected to average 171.8 bushels per acre. Soybean production is forecast at a record high 4.43 billion bushels, up 3 percent from last year. All cotton production is forecast at 21.1 million 480-pound bales, up 23 percent from 2016. Corn area planted for all purposes remains at 250,000 acres. With yield forecast at a record high 170 bushels per acre, corn for grain production is at 40.0 million bushels, up 6 percent from 2016. Cotton production forecasted at 870,000 bales is up 23 percent from last year. Up 30 percent from last year, peanut production is forecast at 806 million pounds with a record high yield of 4,200 pounds per acre. Soybean planted acreage is revised down 100,000 acres from June to 350,000 acres. Production is forecast at 15.0 million bushels, up 14 percent from 2016. Pecan production is forecast at 2.40 million pounds, an increase of 9 percent from last year. Corn area planted for all purposes is revised down 5,000 to 75,000 acres. Cotton yield is forecast at a record high 931 pounds per acre. Production is forecast at 190,000 bales, a 3 percent decrease from last year. Due to a 200 pound decrease in yield from last month, forecasted peanut production decreased to 641 million pounds. Soybean planted acreage is revised down from June to 15,000 acres. Sugarcane for sugar and seed production is forecast at 17.4 million tons, up 3 percent from 2016. Corn area planted for all purposes is revised down to 290,000 acres, an 80,000-acre decrease from June. Corn for grain production is forecast at 46.0 million bushels, down 18 percent from 2016. Yield is forecast at a record high 184 bushels per acre. Cotton production is forecast at 2.4 million bales, a decrease of 300,000 bales from last month but up 10 percent from last year. Peanut production forecast remains at a record high 3.90 billion pounds, up 42 percent from 2016. Soybean planted acreage is revised down 25,000 acres to 155,000 acres. With a record high yield of 45 bushels per acre, production is forecast at 6.53 million bushels, down 9 percent from 2016. Tobacco production remains at 25.0 million pounds, down 12 percent from last year. Pecan production is forecast at 81.0 million pounds, a decrease of 26 percent from last year. Corn area planted for all purposes is revised up 10,000 acres from June to 350,000 acres. With a yield forecast at a record high 135 bushels per acre, corn for grain production is forecast at 43.9 million bushels, just shy of last year’s record high production. Cotton production forecasted at 480,000 bales is up 92 percent from 2016. Forecasted peanut production remains at a record high 468 million pounds, up 38 percent from last year. Soybean planted acreage is revised up 20,000 acres from June to 400,000 acres. With a record high yield of 36 bushels per acre, production is forecast at 14.0 million bushels, up 12 percent from 2016. Tobacco production is forecast at 22.8 million pounds, down 8 percent from last year. Read the full USDA/NASS Southern Region October Crop Production report.